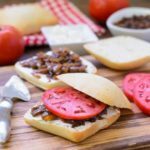 A recipe for a sandwich with caramelized onion, goat cheese, and tomato on a ciabatta roll. It is a great sandwich for picnics and best with fresh picked summer tomatoes. Heat the olive oil and butter in a wide sauté pan over medium-high heat until the butter melts and the oil shimmers. Add the onions and toss to coat with oil/butter. Spread the onions out evenly in the pan and cook, stirring occasionaly, about 10 minutes. Lower the heat to medium or medium-low if the onions are browning too quickly. You do not want them to burn. Sprinkle the onions with the sugar, salt, and pepper. Stir and continue to cook an additional 30 mintues to one hour, until the onions are evenly browned and caramelized. While the onions are cooking, stir occasionally and add very small amount of oil or water if the onions look too dry or about to burn. Once the onions are evenly brown and caramelized, add the balsamic vinegar to deglaze the pan. Be sure to scrape up the browned bits on the pan. Cook for an additional 1 to 2 minutes. Slice the rolls in half. Spread goat cheese on the bottom half. Top with caramelized onions and a tomato slice. Cover with top half of roll.